This couple proved that with an eye for visualisation and a few budget-friendly buys, you can create a beautiful and comfortable home that won't burn a hole in your pocket. 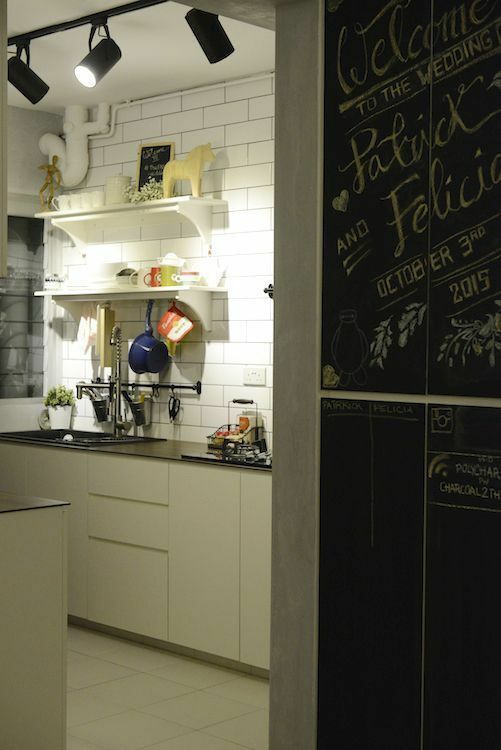 Just like many Singaporean homeowners, newlyweds Patrick, 32, and Felicia, 28, wanted to ensure that sourcing for their furniture and home accessories was going to be effective, convenient, and cheap. Their solution? Online shopping. "The items that we buy online can be shipped to our home directly. This saves us a lot of time—we would rather discuss our buys over a late night coffee rather than spend time walking through a huge furniture store just to look for our perfect piece," says Felicia. It paid off that Felicia is very active in social media—she cites Twitter and Instagram as some of the social media platforms she uses to keep updated about the latest designs and trends. Patrick and Felicia made their bay seat wider than usual to ensure extra comfort: TV cabinet, coffee table, and cushions were all from Taobao. 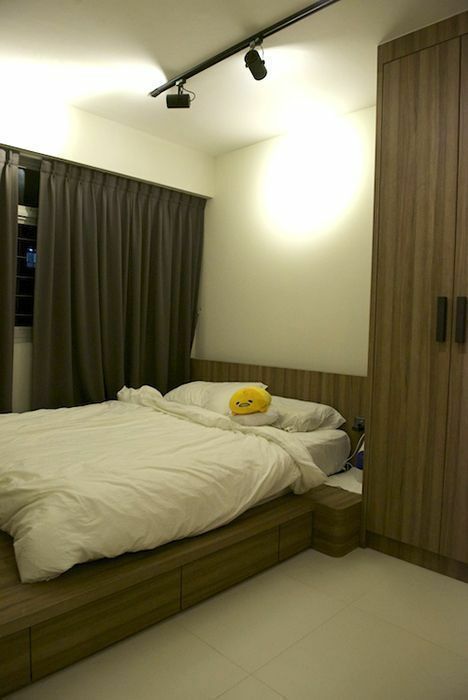 During the planning of their Tampines home, it was very important for the couple that their new home's practical to live in. 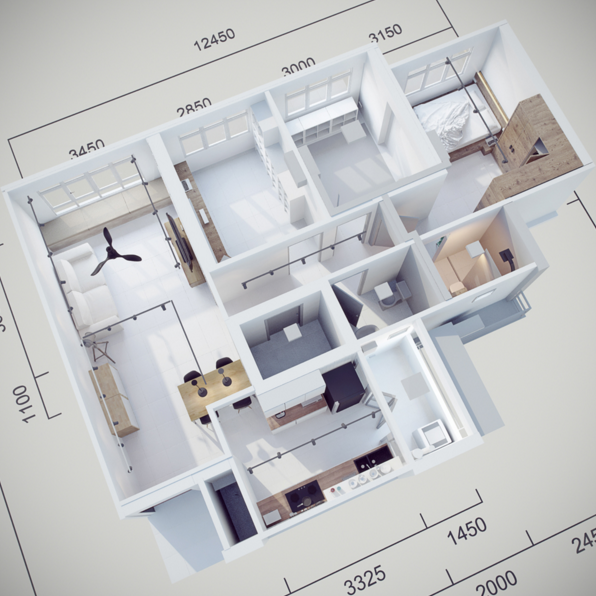 Thankfully, Patrick has a background in animation, which he used to create 3D images that helped them visualise the home and to better communicate with their contractor. "The drawings were so realistic that people thought it was the real thing!” says Felicia. Patrick used Autodesk 3ds Max to create the 3D plans. 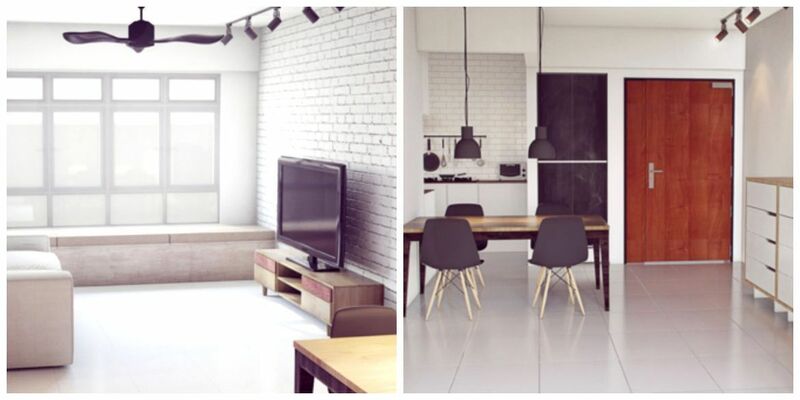 Dining table and Eames chairs from Taobao. Experimentation was also key to producing the right furniture for them. "We didn’t want to leave everything to our contractor," Patrick says. 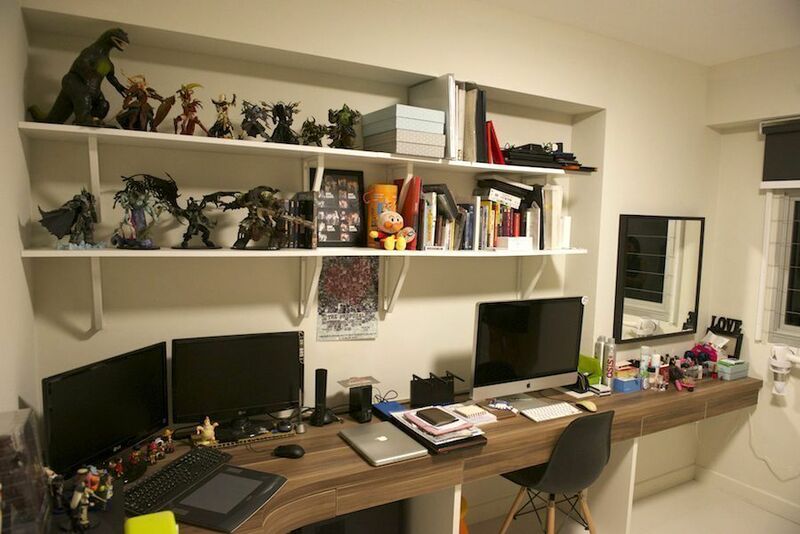 "I did my research online to find the ideal length, width, and height of the furniture. We made a makeshift object based on those dimensions and tried using it. We would then ask the contractor for his advice." Thanks to this thorough research and experimentation, they found the appropriate dimensions for their platform bed, living room bay window, and curved desk—items which they count as favourites in the house today. To make their platform bed extra comfortable, the couple included a soft light behind the headboard that's easily accessible from their bed. The platform was also made wider so that there's a space for Felicia to put her laptop and other necessities. The guest room doubles as a baby room, and is one of the couple's favourite areas in the flat. 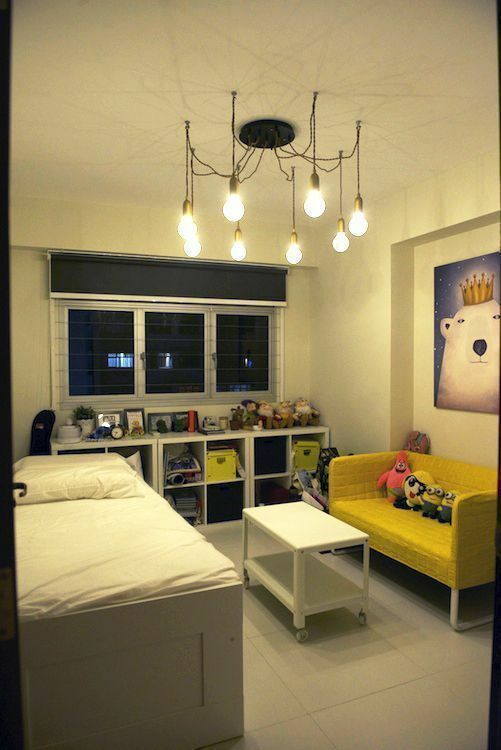 Polar canvas, yellow boxes (seen in the shelves), and spider lights from Taobao, and yellow sofa from Ikea. The desk was specially curved to accommodate Patrick's working needs. Hairdryer holder (by the window) from Taobao. 1. Look for reviews under "累计评论" on Taobao’s page. You’ll need to scroll down the product page a little before you see it at the top of your page. Some reviews will come with images of the product, which will allow consumers to gauge if the product s safe to purchase. 2. Accumulate all your chosen items before opting for sea shipping. "We used sea shipping for buying bigger items like our wooden cabinet and dining table as it was more cost effective." 3. If you can communicate in Chinese, download Aliwangwang. This application allows you to communicate directly with the Taobao seller. Using this, you can ask sellers to send you pictures of products and advise on the dimensions of the products. 4. Buy your items on Singles Day. (Singles Day is a popular Chinese festival held for Singles on the 11th of November) It is the Chinese equivalent of the Black Friday sale in the United States. It is during this day that you'll be able to find many good deals and discounts from Alibaba sites like Taobao and Tmall. 5. Request that the seller "加强包装", which means, literally, to "strengthen shipping packaging", especially for fragile items. For Patrick and Felicia, functionality, more than anything else, was on the top of their agenda. With a bit of skill and some savviness, they managed to create a warm, beautiful yet practical home that promises to work for them for years to come. We'd love to feature your home. Drop us a note at hello@cromly.com. Check Cromly Shop for your furniture needs and home accessories.